Story is an essential component of human society: Story is how we get to know one another, how we come to understand the world, and how we decide on and live out shared values. From the moment Thespis first stepped out of the chorus and became the first actor to speak words in a play, drama has been the way many of the stories most important to society get told. From Aeschylus’ The Persians to Norman Lear’s All In The Family to Christopher Nolan’s The Dark Knight, the most popular drama reflects and comments on the ways we are responding the questions our context pose to our essential humanity. And as societies changed over time, the general trend of cultural and technological development has been to place greater and greater emphasis on drama’s visual elements: Changing architectural trends made it possible for larger audiences to have clearer views of the stage; the ability to project giant glowing images on darkened walls gave every audience member the ability to see an actor’s every expression; televisions invited actors into an audience’s living room for family scrutiny. Now, during an era when technology allows people to pour themselves into TV shows on noisy trains, stare at their screens while waiting in line and cradle movies in their bed as they fall asleep, dramatists often rely on actors having a specific look to make a certain point about their inner character or to explore a certain theme. In order to continue producing the kind of drama that we need to develop, refine and evolve our culture, we need talented, inspired writers and directors who are empowered to produce the best work they possibly can. Until recently, when story-tellers needed an actor to portray a woman with dark hair, fair skin and light eyes, their options were limited, and the most prominent of them was Zooey Deschanel. And I hope we can all agree that that should never happen. No dramatist should be reduced to that. I don’t know Zooey Deschanel personally, so I have no idea whether she’s a nice lady or not. I assume that she is, because I don’t have any evidence to the contrary. And she has a nice voice. And a very striking, very specific look. A look that I can understand a director wanting or even needing in specific roles. However, when you give her lines to memorize and then recite as though for the first time, she becomes a personality vortex that drains the life out of any scene she’s in. She makes it harder for other people around her to act. For example, in a film adaptation of The Hitchhiker’s Guide to the Galaxy that featured a charmless Ford Prefect and a Zaphod Beeblebrox whose second head was hidden beneath his neck, Zooey Deschanel as Trillian was the big problem. Believe it or not, she was the worst thing about Tin Man, a mini-series created to punish people with indiscriminate taste. Even in movies that are otherwise good—movies like Elf and Almost Famous—her performances are jagged blemishes in otherwise polished, beautiful feats of entertainment. The thing is, this isn’t 2004 anymore. This is 2013. Zooey Deschanel isn’t the only dark-haired, fair-skinned, light-eyed actress in Hollywood: Alison Brie exists. Lizzie Caplan exists. Alexis Bledel keeps disappearing for a while then popping back into the world again. Hell, Silver Linings Playbook proved that, in a pinch, we could also just dye Jennifer Lawrence’s hair and put her in a movie instead of Zooey Deschanel. There are plenty of better options for finding a female actor who fits the part. Any part. Q: Which one is a better actor than Zooey Deschanel? A: All of them. All of them are better actors than Zooey Deschanel. 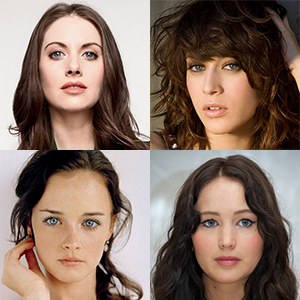 There are plenty of actresses with dark hair and light eyes now—there’s no need to keep putting Zooey Deschanel in movies and on TV. And please, for the good of future generations, don’t watch New Girl. You’ll only encourage her. PrevPreviousCongratulations, America: This is your fault.